During his visit, El-Sisi was filmed dining and chatting with the troops. “Do not hesitate to use all force against them,” he told soldiers, referring to the battle againstterrorism concentrated in the North Sinai province. Suffering from economic hardship was nothing compared to the collapse of the state, hesaid. Keen on a high turnout, regardless of the expected final result, the government has beenworking to ensure polls are safe and open to all. The interior ministry and military havebeen beefing up security nationwide ahead of the elections. Last month,the Daesh terrorist group issued a 23-minute video threatening to conduct attacksduring the Egyptian elections. The group warned Muslims in Egypt to stay away frompolling stations and avoid large gatherings, vowing to carry out attacks during the domestic vote. It has also levelled threats againstEgypt's Christian community. Despite increased security measuresahead of the polls, a carbomb went off in Alexandria on Saturday, killing two policemen and injuring several others. The intended target was Alexandria Security Director Mostafa El-Nemr, who is said to have survived unharmed. No group has yet claimed responsibility for the carbombing. Unruffled by the race, El-Sisi made two public speeches lastweek, calling on Egyptians to "make Egypt's voice heard” by participating in the ballots, regardless of their political orientation. Other than that, the 64-year-old incumbent seems to have been unconcerned about the upcoming electoral battle, leaving his campaign team and supporters to win votes while he continues with his normal presidential duties, with national security figuring high on the list. Over the weekend, major television and radio stations have been playing patriotic songs that call on Egyptians to participate in the elections, as well as the national anthem, and a song sung by the Egyptian army’s shock troops. Voters will be going to the polls across Egypt over three days, starting Monday, with the winner scheduled to be announced by the National Elections Authority (NEA) on 2 April. Egyptians living abroad have already cast their votes, attending polling stations from 16 to 18 March, although the results of those ballots will not be announced until the final election results are issued. Around 59 million Egyptians are eligible to vote, according to NEA statistics. El-Sisi's only rival in the election isMoussa Mostafa Moussa, the head of the Ghad Party, and a man who has publicly declared himself a supporter of El-Sisi's policies. A last-minute entrant to the race, Moussa submitted his application to register as a candidate just an hour before the deadline for registration. Several weeks earlier, Moussa had been collecting endorsements for El-Sisi to run for a second term. He has said that he entered the race after other prospective candidates dropped out, with the aim of avoiding a one-name election. 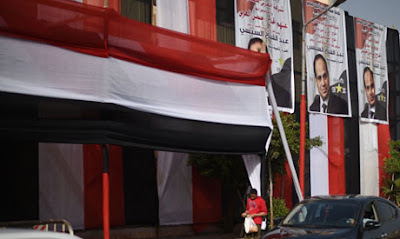 Many of the capital’s streets and public places boast banners advertising local business or residents’ support for El-Sisi, while the president’s official campaign billboards are on display in major squares. By contrast, pro-Moussa banners have been harder to spot in Cairo, apart from around his party headquarters in the downtown area. Nearly a week ahead of this year's vote, El-Sisi appeared on screens in a glossy pre-recorded TV interviewpackage, which was broadcast by a number ofmajor channels. He told his interviewer that he should not be blamed for the election seeming to be a one-horse race. "It's not my fault," he said. "I swear to God, I wish there had been ... 10 of the best[candidates] and [for people to] choose. But we are not ready yet. Isn't it a shame?" hesaid. He made the comments in response to a 10-minute clip comprised of interviews withdozens of citizens around the country, who aired their grievances about their fears of imprisonment, tough economic conditions and soaring living costs. El-Sisi hinted that the problem lay in Egypt's over 100 political parties not fielding any candidates. Two other possible candidates — former military chief of staff Sami Anan and Colonel Ahmed Konsowa — were arrested after announcing their intention to stand for breaching the laws of military service by running for office before ending their service and without seeking the army's permission. Egyptian authorities have rejected accusations that candidates were pressured to withdraw. In numerous TV and newspaper interviews, Moussa, El-Sisi’s only competitor, has made the same assertion, namely that he’s not a “puppet” of the current regime. In interviews, he has made few policy pledges besides his "patriotic obligation" to protect the country from the Muslim Brotherhood. He said he expects 60 percent of eligible voters to head to the polls, far more than the 47 percent turnout in the 2014 vote that brought El-Sisi to office.